Originally intended as utilitarian objects that provided warmth and comfort, Oriental rugs evolved to become elaborate art forms for kings and commoners alike. Pleasing in symmetry, color and design, the Oriental rug is as ancient in purpose as it is modern in comfort. Yet, little is known about its origins. We do know that the oldest surviving rug with the handwoven symmetry that has become the trademark of Oriental rug design was uncovered at a burial mound near Pazyryk in Siberia, and that it dated to the 5th century B.C. 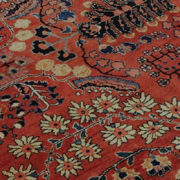 Handcrafted with natural dyes and painstakingly crafted with heavy wool thread to create a story of color and culture, an early Oriental rug is an art form worth collecting, but if it has been properly cared for during its life, it can continue to serve the original purpose for which it was intended while enhancing a living space. 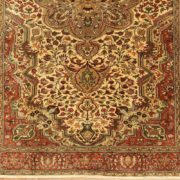 Where is an authentic Oriental rug produced? Oriental rugs have been made in North Africa, the Middle East, and Central Asia, encompassing Morocco, China, Tibet, Turkey, Iran, Russia, Azerbaijan, India and Pakistan. Early fragments of Oriental rugs have also been found in Syria, Iraq and Afghanistan, dating to the first century A.D.
What sorts of materials are usually used to produce an Oriental carpet? All Oriental carpets are made from natural fibers, such as the wool from sheep and goats’ cotton and silk. 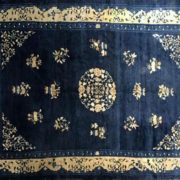 Some locally produced carpets in the Far East, e.g., China and Russia have even produced carpets using yak and horsehair. 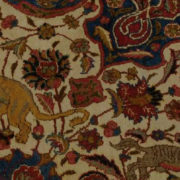 Camel wool can also be found in some local Middle Eastern rugs. Cotton is stronger than wool and is used as the foundation of the warp and weft threads since wool tends to shrink over time. Silk is usually reserved for more decorative wall hangings and tapestries. Strands of fibers are stretched and spun into single strands or multiple strands known as “ply.” One strand is one ply, two strands are two ply, etc. The more ply, the stronger and more durable the carpet. Are some rugs actually hand-woven? Yes. 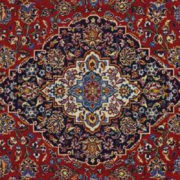 It could take up to a year to produce a completely hand-woven Oriental rug of a particularly elaborate design on a loom. What are some terms to know? 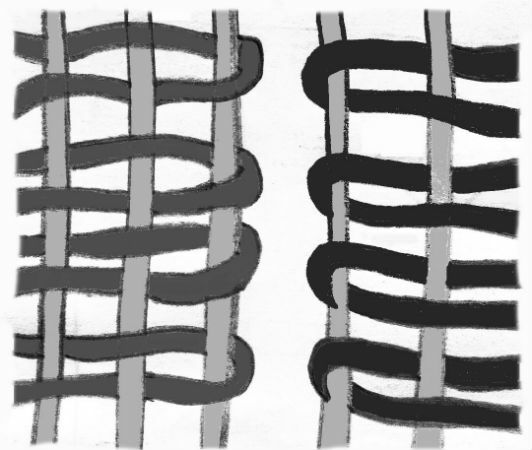 Horizontal yarn is called the warp; vertical strands are called the weft. Pile is made by threading individual yarn around two or more warp strings and tamped down to form a row. Upon completion, the threads are cut to create a raised surface. The pile is made using either a Turkish (Ghiordes) knot, which is more symmetrical and the more common knot; or the Persian (Senneh) knot, which is more asymmetrical and used to form more elaborate designs. 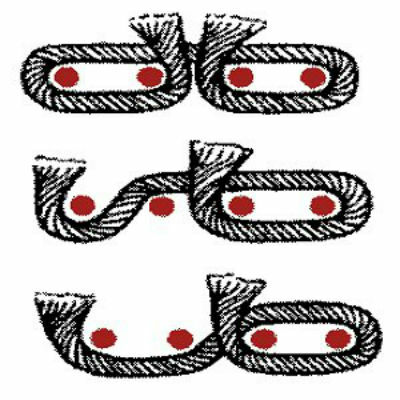 A Jufti knot is wrapped around four warp strings, which saves on material but doesn’t last as long as the other knots. The more knots per square inch (kpsi) in a woven rug, the more durable and long lasting it will be. It is easier to count the number of knots per square inch by counting them on the reverse. Rugs with knots per square inch lower than 80 won’t last nearly as long as one that has at least 330 kpsi. 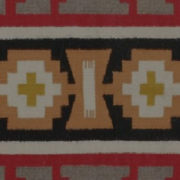 However, kpsi is only one measure of quality; the intricacy of design and where it was made also affect a rug’s value. The reverse of this Qom rug shows a high knot density. Image courtesy of Arie M. den Toom, licensed under the Creative Commons Attribution 3.0 Unported license. What are the elements of an Oriental rug? From the outside in, an Oriental rug’s design basically consists of an outer secondary border (sometimes called selvedge, where the warp is tied off to prevent raveling), the larger main border, and the inner secondary border that frames the central design element. 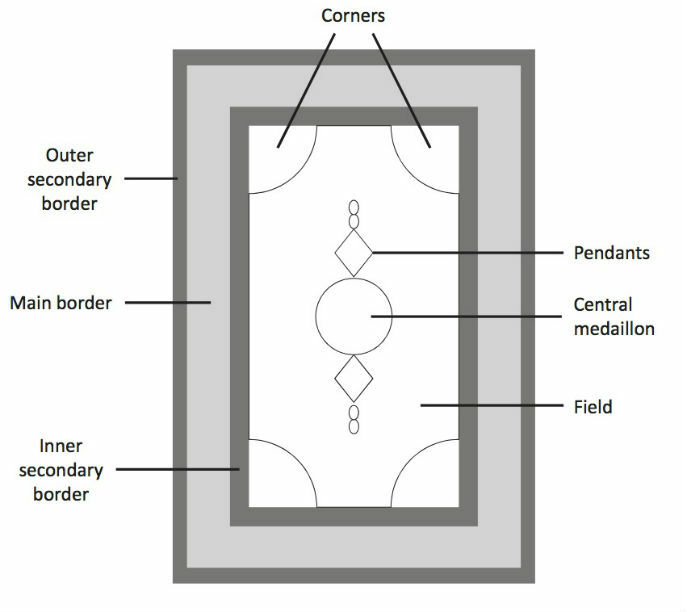 The central medallion draws one’s eye initially for its distinctive design, usually with a pendant design above and below the central medallion. These are placed on the field with additional elaborate designs on each of the four corners. How can I know which type of Oriental rug would work best in a particular space? There are two basic types of Oriental rugs: kilim and pile woven rugs. Kilim is a flat rug that doesn’t show any knots but does show a space in between the warp threads. A kilim can be used as either a floor covering or tapestry. Kilims aren’t as durable as pile rugs and traditionally served as prayer rugs and horse blankets. A Senneh kilim rug from Persia, late 19th century, 6ft 3in x 4ft 3in. 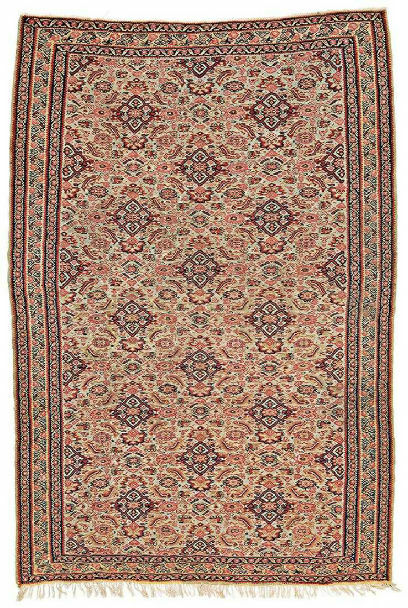 Image courtesy of LiveAuctioneers Archive and Austria Auction Co.
Rugs with more pile last longer especially if they are to be placed in a high-traffic area. Remember: the higher the kpsi, the more durable the rug. 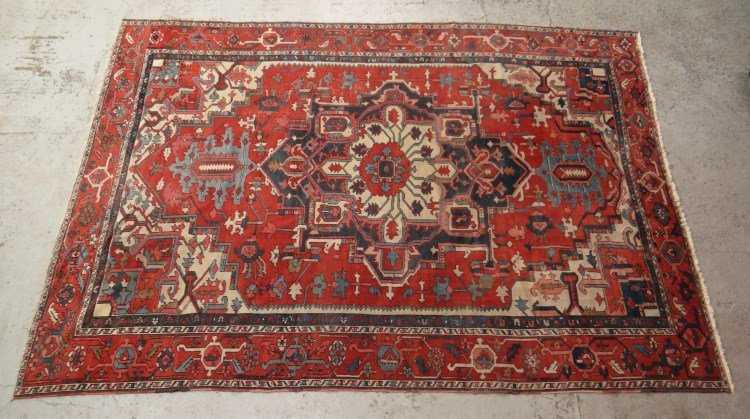 What are the dyes used in an Oriental rug? Aniline dyes, or chemical dyes, came into use in the 1860s. If the dyes in a rug are natural, it may have been made anytime in the past 3,000 to 5,000 years. Natural dyes might have been made from plant roots — onion for yellow, oak for black, and other colors from the madder plant or cochineal insects like the ladybug. Sometimes byproducts from different sources were combined to create a particular hue. Most rugs are made from synthetic dye, but modern-day Turkish rug makers are reviving the natural-dye process, so it may be difficult to know the difference between natural or synthetic dye without a chemical analysis. Abrash is a term that means the fading of one color within a given rug. This occurs when there is a shortage of a type of yarn during a rug’s production and another, newly dyed yarn is used as a substitute. It isn’t possible for yarn to be dyed exactly the same color each time, so in such cases where a different yarn lot is used as a substitute, discoloration can occur naturally. What must I do before choosing an Oriental rug? Measure the area where the rug will be used. Oriental rugs are not usually wall to wall. Allow at least a foot of space from the wall itself. Rugs range in size from 2 by 3 feet to more than 10 by 14 feet. Runners measure 30 inches wide. It’s best to take a photo of the area where the rug will be placed to compare and contrast with the rugs you are considering. 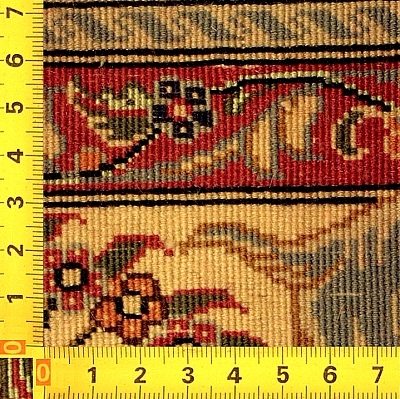 As a rule, an 8-by-10-foot Oriental rug will cost between $1,000 and $5,000. A pattern that is clear and distinctive is, at times, more important than the kpsi. Geometric designs need fewer knots to create fine detail than a more elaborate floral pattern does, for example, and therefore might be more useful if placed under a large dining room table. 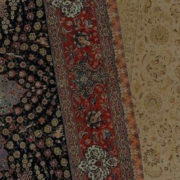 Also, the rug’s age, quality of the wool and type of dyes used are all important factors. Don’t be afraid to ask questions about where a rug was manufactured, whether it was hand-woven or commercially produced, and whether synthetic or natural dyes were used. Ask about the seller’s guarantee and if a certificate of origin will be provided. Finding a vintage Oriental rug requires more in-depth knowledge than buying a more contemporary one for home use. 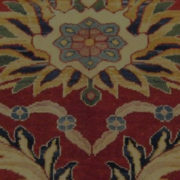 For example, rugs from Turkey differ in quality and design from those produced in tribal Iran or China. There is really just one simple rule to follow: Go for the best quality you can afford and buy what you like.